The grapes are partially de-stemmed and the varieties are pre-blended in concrete vats. Vatting time :3 to 4 weeks. Vat-matured for around 24 months, part of which is spent in oak barrels. USA - VINTAGE 2013 - Another modern styled effort from this estate is the 2013 Chateauneuf du Pape Duclaux. A blend of Grenache and Mourvèdre that spent 24 months in concrete tanks, with a small part in barrel, it has solid ripeness in its cassis, black raspberry, licorice and vanilla aromas and flavours. Medium-bodied, polished, balanced and with excellent length through the finish, it should drink nicely out of the gate. USA - VINTAGE 2013 - Ruby-red. Cherry, blackberry and candied lavender scents pick up peppery spice and smoky mineral qualities with air. Supple red and dark berry flavors stain the palate, and bright acidity adds focus and spine. Supple-textured and nicely energetic for its heft; fine-grained tannins build slowly and shape the sappy berry fruit on the finish. USA: VINTAGE 2011- The star of the lineup, the 2011 Chateauneuf du Pape Domaine Duclaux is a beautiful, possibly outstanding 2011 that gives up impressive blackberry, cassis, spice and licorice. Medium to full-bodied, with great fruit and surprising freshness and purity, it will dish out loads of pleasure over the coming 6-7 years. Drink now-2020. Vintage 2010: Concentrated, mature garnet. Rich nose of spice, liquorice, maquis, condiments and jammy stone fruits. Power, fullness and generosity on the palate revolve around more of the nose aromatics. Rich core and an energetic finish. 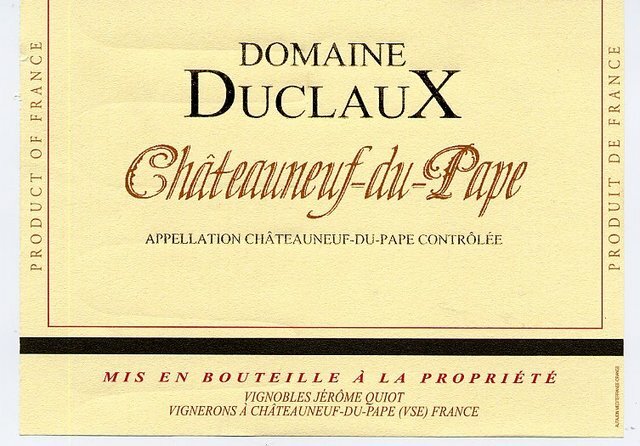 vintage 2010 - The Domaine Duclaux’s 2010 Chateauneuf du Pape is also outstanding. It exhibits zesty acidity along with lots of earthy, black truffle, black cherry, new saddle leather, roasted meat and cassis notes. Unlike the Vieux Lazaret 2010, this full-bodied, structured offering begs for 2-3 years of cellaring, and should keep for two decades. Jerome Quiot is one of the largest landholders and most influential political figures of the entire region. He also owns a number of domaines and produces significant amounts of Chateauneuf du Pape from his 125 acres of vines, most of it very good, often outstanding. Vintage 2010 - Vivid ruby. Ripe aromas of cherry, plum, cola and spices. Nicely concentrated and lively, offering bitter cherry and red berry compote flavors and a hint of candied licorice. Shows very good focus and energy on a long, sappy, penetrating finish that features slow-building, fine-grained tannins.